Most investors understand how taxes apply to capital gains, dividends and interest. But those accustomed to mainstream assets like stocks, bonds and funds can be surprised when they get off the beaten path with Treasury inflation-protected securities, zero-coupon bonds, S corporations and other unfamiliar investments. 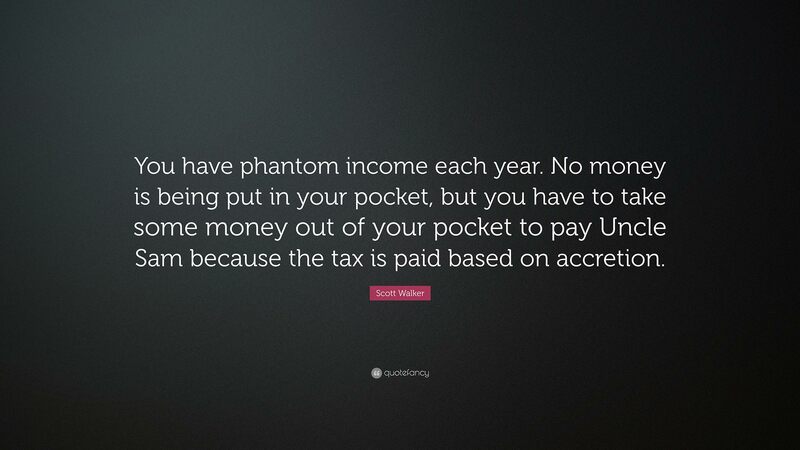 “Phantom income is income that is attributed to one’s tax liability, but without receiving the cash to offset the tax liability,” says L. Burke Files, president of Financial Examinations & Evaluations in Tempe, Arizona. Treasury inflation-protected securities. TIPS are designed to protect the investor from inflation by increasing the principal every six months by the inflation rate. A $10,000 investment could therefore be revalued at $10,300 if inflation ran at 3 percent. Then the bond’s yield, or interest rate, would be applied to the new principal, raising the interest income a tad. That interest payment would be taxed as ordinary income if the bond were held in a taxable account, just like interest from an ordinary bond. And the $300 principal increase would be taxed as well, even though the investor would not pocket that money until the bond matured and all principal was returned. To add insult to injury, the principal increase is taxed as income rather than at the lower long-term capital gains rate that would apply to an ordinary bond held for more than a year and sold at a profit. Zero-coupon bonds. These are a type of government or corporate bond that pay no interest. Instead, the investor buys the bond at a discount and then receives the full face value when the bond matures. These bonds appeal to investors who want a predictable payoff tied to a future need like retirement, and to those betting interest rates will fall, since prices in the secondary market can be very volatile. Falling rates make an older more-generous bond very attractive. But, again, the investor must pay income tax on the bond’s annual increase in value, even though no cash is received. Other types. Phantom income can also be a problem for investors in S-corporations, partnerships and limited liability companies, says Parag P. Patel, a tax attorney with offices in New York, New Jersey and Florida. “The entity reports to the IRS via the tax return and the corresponding K-1 [form] who the owners are and their corresponding assigned amounts of income,” he says, noting that the income reported may be larger than the actual cash distributed to the investor if the business reinvests some income or holds it in reserve. Avoiding annual tax. Investors can avoid phantom income tax by holding these types of securities in tax-favored accounts. In individual retirement accounts and 401(k)s there is no annual tax on either interest earnings or principal increases. Instead, withdrawals – generally after age 59½ – are taxed as income. In Roth IRAs and 401(k)s, neither interest nor principal gains are ever taxed, even after withdrawal. Ugly surprises can be avoided if one invests though a fund that makes regular distributions of principal increases as well as interest earnings, says Anish Ramachandran, senior vice president of investment management at Lido Advisors in Los Angeles. While the investor in TIPS or zero-coupon bonds may be stuck with phantom income, investors in S corporations and other businesses that could have this problem have various remedies, Files says. “An example of a hedge [against] phantom income would be an offset by deductions such as depreciation or depletion allowance,” he says. “It is common for oil and gas portfolios to hold zero coupon bonds whose maturity is tied to the end of the oil and gas partnership or the economic life of a given oil and gas field. The phantom income is offset by depletion allowances and depreciation. The investor who gets off the beaten path of stocks, bonds and funds is wise to look into how the business will minimize phantom income, as it may be necessary to set aside other funds to pay tax.